Keep Your Blades Cutting Like New! are harder to control, increasing risk of potential injury. like razors, scissors, axes and chisels for unbeatable versatility! just rinse the stone under running water for a quick and easy cleanup. We love whetstone sharpening because it's fast, efficient and effective for most blade materials! is great for users of all experience levels. 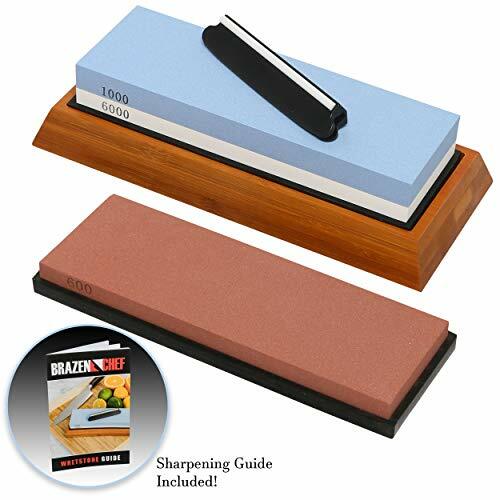 Why Choose Our Sharpening Stone? Try Today Risk Free with Our 30-Day Guarantee! Order Your Whetstone Now for Razor-Sharp Blades! 3 GRIT WHETSTONE KIT - Allows full range of knife sharpening. 600 grit is needed to go from dull to sharp. 1000 grit is used to deburr. 6000 grit to hone, so the blade stays sharper for a longer period of time. Compare on Amazon - 1000/6000 grit knife sharpening kit $35.99 + 600 grit stone $14.99 = OVER $50.00 VALUE! Safety First - Thanks to our non-slip bamboo base, you can use our knife sharpening stones with complete confidence and control! each order includes an instructional guide and access to our support website, ensuring correct use and proper honing angle. Easy to Clean - While other kitchen knife sharpener s require batteries or a complicated set-up, our user-friendly whet stone is perfect for pros and beginners alike! Your whetstone arrives ready to use. When you're finished, just rinse the stone under water for a hassle-free cleanup. 100% Money back guarantee - Premium Quality - Made with aluminum oxide stones, our wet stones for sharpening knives work fast, are compatible with a range of blade materials, and don't require messy or expensive oils! the compact, beautiful design saves counter space and fits nicely in a drawer. If you have any questions about this product by Brazen Chef, contact us by completing and submitting the form below. If you are looking for a specif part number, please include it with your message.